Goes perfectly with opening presents. A while ago the generous people at POM Wonderful sent me a case of their 100% Pomegranate Juice. They did not ask me to blog about it or even make a recipe with it, but the moment I took my first sip I knew I wanted to make something with pumpkin and pomegranate. Boy am I glad I came up with that ideal because these muffins were fantastic! I think they would be the perfect accompaniment to Christmas morning. Now go bake them! To prepare the filling, in a saucepan over medium-high heat, bring pomegranate juice to a boil. Reduce heat and simmer, swirling pan occasionally, until reduced by about a third, 10-12 minutes. Pour into a glass measuring cup nested in a bowl of ice water and stir constantly until syrup is thick and barely warm to touch, 3-4 minutes. Remove from ice water. Combine the cooled pomegranate syrup, cream cheese, and powdered sugar and mix until smooth.Chill mixture in the fridge while preparing the muffins. 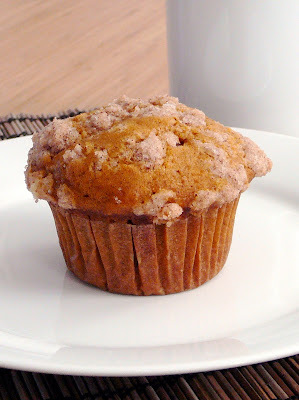 To make the muffins, combine the flour, spices, salt and baking soda in a medium bowl. Mix well and set aside. Beat together the eggs, oil, sugars and pumpkin puree until well combined. Slowly add the dry ingredients until just combined. To make the topping, combine all ingredients in a small bowl. Mix together until crumbly. Preheat the oven to 350°. Line two muffin pans with paper liners. 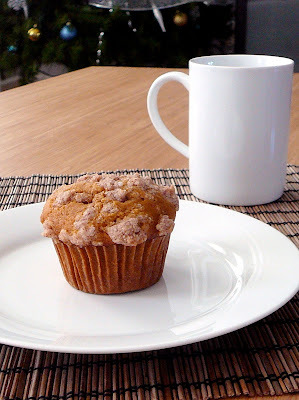 To assemble the muffins, fill each muffin cup halfway with batter. Spoon a tablespoon of the cream cheese mixture into each muffin cup. Divide the remaining muffin batter evenly among the muffin cups, on top of the cream cheese mixture. Sprinkle the topping over the top of the batter. Bake for 20-25 minutes. Let cool completely before serving.